Blueprint Homeschooling is for home educating parents of all philosophies and styles who are looking for a better way to manage their time, energy, and sanity throughout the school year. Do you spend your school days searching for missing ingredients to science experiments? Do you feel like you are constantly behind or like you are not doing enough? It doesn't have to be this way. 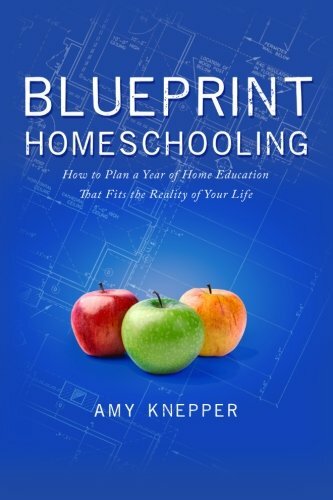 Blueprint Homeschooling is a friendly, humorous guide to planning your school year. Part workbook, part reference, it includes 43 step-by-step exercises to help you sort out your own approach to home education. Before you even take a glance at a calendar, you'll discover why you homeschool, explore some of the educational philosophies and teaching methods available, and set goals that take into account the reality of your life. By the time you finish the book, you'll have all the tools and supplies to make it through an entire year of home education, fine-tuned to the real world you live in. Topics include: ~Discovering your values ~Understanding your child's learning style, your teaching style, and educational philosophies ~Setting long-term and short-term goals ~Setting "bare minimums" for events like illnesses or major life changes ~Creating a schedule that fits your daily reality and energy levels ~Scheduling recurring events (like holidays, tournaments, or sports seasons) ~Creating your own curriculum using library resources ~Avoiding burnout Filled with practical advice and stories from those in the homeschool trenches, Blueprint Homeschooling has something for beginners and seasoned homeschool veterans alike. Amy Knepper is co-founder of a homeschool community in Washington State that serves hundreds of families with educational opportunities in theater, art, music, science, and math. Now living in Southern California, she devotes her time to local and online communities about writing and education. She has been homeschooling her two kids for seven years and is an avid fan of black tea, Korean dramas, and video games.